Hallelujah, this is a cake from the heavens! 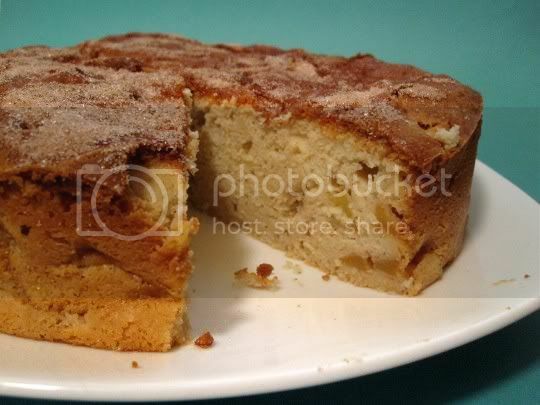 Sweet, buttery, SUPER moist, chockful of juicy apples and cinnamon-y flavor...and after one bite, you definitely would NOT believe this is a lowfat recipe! There are eggs and butter in the cake batter, but I think the secret to its extra moistness is the fat-free cream cheese that's used. With the combination of the chopped apples, this cake becomes so ridiculously moist that it's almost creamy and pudding-like. It is fully baked, but each bite literally melts in your mouth. And speaking of baking, I had to bake mine an additional 20 minutes past the one hour suggested time. After an hour, the cake will form a crispy brown crust...but don't be fooled! This does not mean it's done. An inserted toothpick found the center of the cake to still be rather uncooked. The 20 extra minutes seemed to be fine, but I probably could have gone another 10 past that. The tricky thing about super moist cakes like this is that you want to be sure they're fully baked, without baking too long for them to get tough, but without baking too quickly that the bottom is "wet." This cake bottom was wet (not too bad, but I'd hate to leave this sitting around), but maybe that was due to me leaving it in the springform pan it was baked in overnight. Ah well, very small price to pay for such an amazing and addictive treat! Make again? This is one for the books, and good enough for dessert or even breakfast! A glass of ice cold milk or steaming hot coffee is highly recommended.